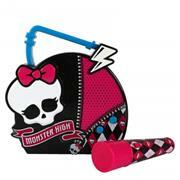 Enjoy making music on this unique and stylish Monster High Sing-A-Along Karaoke system from Sakar. The teenage children of the legendary monster menaces have gathered together under one roof...to attend high school at Monster High! These girls are wild, they're fierce, and they're totally trendy. They've left their parents' outdated haunting habits behind to form a killer style all their own. When you see them, you'll just have to gasp "Drop dead...gorgeous!